So, apparently my sister likes Rilakkuma..Elder sis decided to throw her a Rilakkuma-themed surprise party and I was too lazy didn't know what to do for the programs so I offered to make a pinata. It's been a very long time since I did art and crafts and those sort. Nope, I haven't been making cards cause I feel like it neither did I drew or sketch anything lately. I actually like doing those, alone. ._. 1. I used a marker pen and roughly sketched out the shape of the not-so-round head on the shim ramyun cardbox and used a blade to cut it off. Imagine - it's in 2D. So I cut double of this. 2. Cut out the shape of the ears to be combined on the head. I cut out 4 of this. 3. Now, patch the ears on the head using masking tape. I also used stapler to make the ears secured to the head. 4. 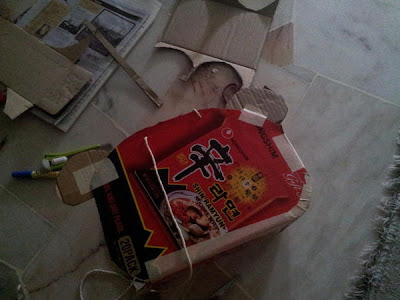 In order to make it 3D now, I cut off the remaining cardboard from the shim ramyun cardbox and make sure it's long and wide enough to connect the heads and ears from one side to the other. 5. This is the difficult part. I was doing this alone. 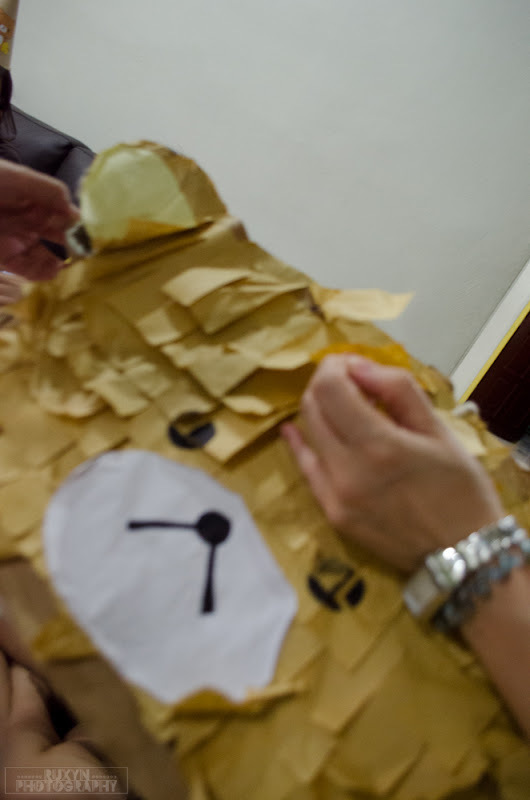 Patching up cardboards together to make it into 3D is not easy T_T. I used a lot of masking tapes to make the patching firm. Then stapler them together to ensure it's more secure lol. Start with connecting the bottom, the base of the face. Then connect the one side of the cheeks first. And move up to the ears. Then, STOP patching. 6. Now, you should already puncture two holes (I used blade to cut a small hole) and insert the ropes on each side of the face. I used two separate ropes for each face. 7. Stuff in the items you want to put inside now. I stuffed in my Rilakkuma soft toy now, which took about 90% of the space. 8. 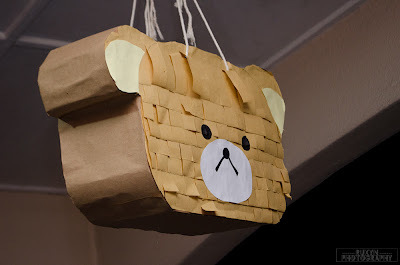 Because there were some empty space and I thought that the empty space would make the pinata break easier, I decided to put newspapers to fill in those spaces. LOL. 9. Continue patching the other side of the cheeks and the ears, and then the top of the head. I used a lot of masking tape here. 10. It should be done now, it's time to decorate. I traced the shape of the head (2D again) on a brown paper so that I can cover the box with one layer of brown paper first. 11. Using a brush, I spread out the PVA glue to stick the brown paper on the cardbox now. 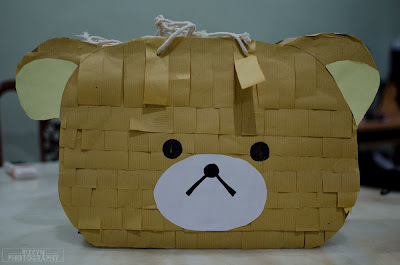 Once the whole head is covered with the brown paper, it should look rather neat. 12. I cut out very long strips of brown mahjong papers so that I can stick across the head. Refer to picture above for example. 13. Using PVA glue again, I stick these strips of brown mahjong paper on the face. 14. Cut out the (yellow) part shape of the ears. And stick them on the ear. 15. Cut out a oval-ish shape white paper and paste it on the lower middle part of the head. 16. Draw the eyes and the nose with black marker pen. You're done! LOL, the picture is out of focus, but you can see that even after whacking this thing for 30 minutes, the face didn't come off! I mean the brown manjong paper didn't come out man. LOL so surprised.